NTN-SNR will be exhibiting at the European Mechatronics Meeting (EMM) 2012. In addition to a technical presentation (to be held on June 7) on EV system products utilizing NTN-SNR’s sensor and control technology, there will be dynamic exhibits of the four-wheel electric commuter “Q’mo,” the In-Wheel Motor System and One Motor Type Electric Vehicle Drive System. We look forward to seeing you at the event. In-Wheel Motor System(see here for details) and Compact EV Chassis Model A compact in-wheel motor that utilizes a thin hub bearing, reducer and motor, which can be mounted within small diameter wheels of commuters. 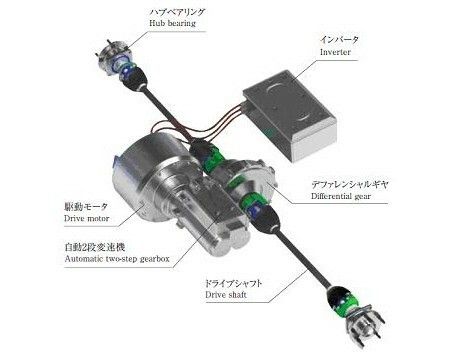 The system also includes a drive motor, reducer, hub bearing and inverter for advanced vehicle control. One Motor Type Electric Vehicle Drive System(see here for details) Coordinated control of the vehicle drive motor and gear actuator allow faster, smoother gear changes, while selection of the most appropriate gear ratio to suit the vehicle’s driving conditions provides smooth acceleration, even with a lightweight drive motor. Selection of the most appropriate gear ratio ensures high-speed driving, as well as increasing the driving mileage available from a single charge.